This week, whilst the rain falls from the sky and the wind howls I have been using up some left-overs – in the kitchen and on my hook. Since I don’t drink milk, Mr Snail has been bringing the stuff back and forth in a cool bag for the weekends. Last Sunday, however, there was a small amount left that was aging and not worth transporting back, so he left it with me. I put a few drops of lactase enzyme in it so that it wouldn’t upset my digestion and kept it in the fridge. Then yesterday, when I ran out of bread, rather than making myself a loaf, I made a cheese scone (I can eat hard cheese in moderation, as it has little lactose in it). Scones are always lighter when made with sour milk, so it’s a great way to use it up. 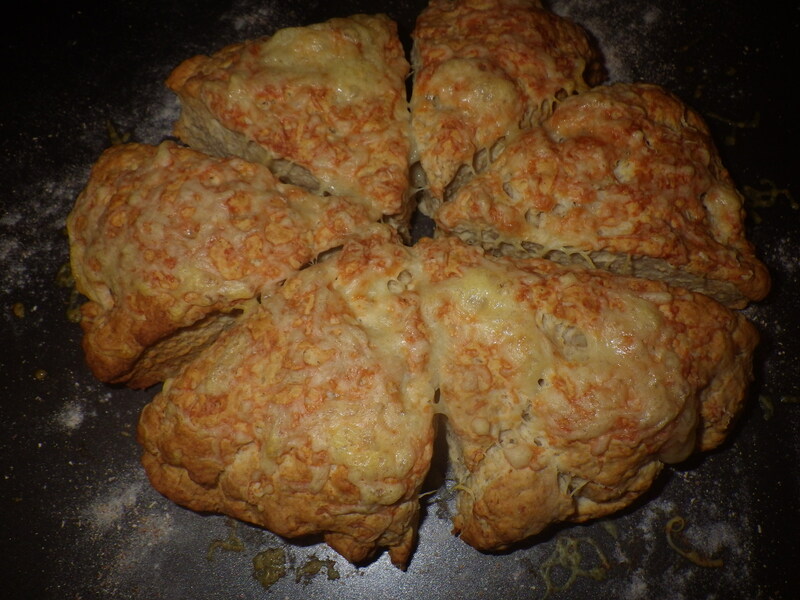 Mr Snail is not a big fan of cheese scones but I love them, so it’s ideal to cook them when he’s away. When he’s home, I use sour milk to make waffles, which also benefit from it as an ingredient. And then I moved on to left-over yarn. For Mr Snail’s laptop case, I bought three balls of yarn but only used two of them. Since he liked the self-patterning effect so much, I decided to make him a hat with the left-over ball. He’s not here to model it and this post will be the first time he’s seen it. I’m rather pleased with the way it turned out. I didn’t work from a pattern – just made it up as I went along. It is worked entirely in half-trebles (UK terminology). I’ve also been using up some left-over cotton yarn for another project, but that’s a gift for one of you out there, so I won’t share the picture until after it’s been received. So, have you made anything interesting with left-overs this week? The only left-overs I had this week were down my shirt when I actually managed to miss my mouth. The only thing I made was a mess. What are the chances of making me a bib? Perhaps Ruben will lend you one! Yes, it’s funny isn’t it? I like the way the hat looks too. I wonder how a yarn can be so different in a different context. 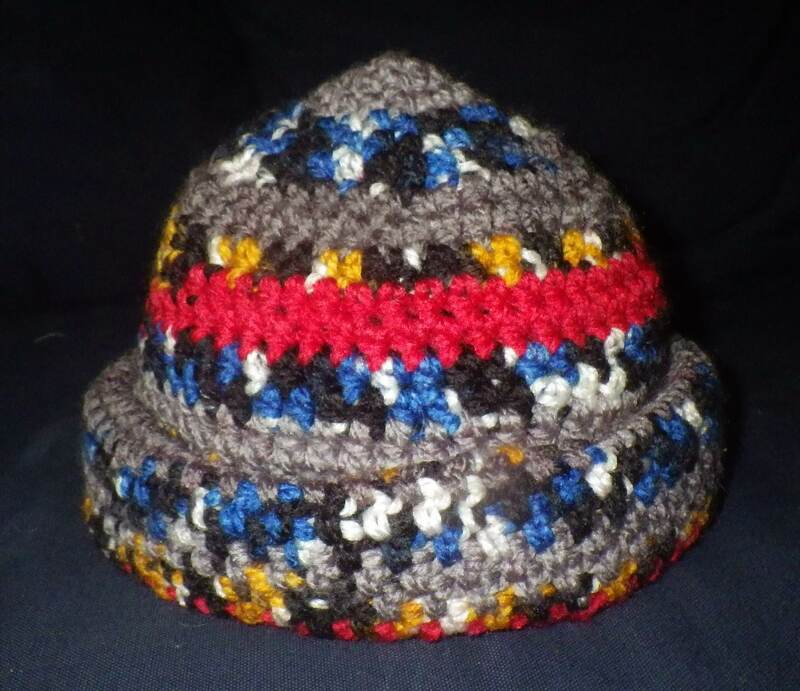 I’m strangely pleased with the way it turned out… and it really is a very cosy hat. Does being trendy mean I am going to have to wear the hat every time I use my laptop? I can’t claim any credit… it was a self-patterning yarn and Mr Snail was the one who chose it. I do think the hat looks rather smart, though. I think cheese scones sound fab! May need to make some soon–my cider doughnut muffins are finally gone! I have been alternating going great guns in the garden with furiously creating. I have yet to get active on my narf square for the blanket of latecomer happiness as I am creating something entirely different for my eldest daughter. I wish I could eat cheese scones but I am firmly back on the wagon when it comes to food as summer is just around the corner and finds my derriere a bit bigger than I feel comfortable with. I will just imagine how delicious they taste :).